This is an important book from a uniquely informed source on a critical and timely topic. Beyond Snowden, written by Timothy H. Edgar, a civil liberties lawyer who had a ringside view of development of government surveillance programs, provides a deeply detailed insider’s account of how they came into existence, the controversies that have surrounded them, and the ways that legislators, presidents, activists, technologists, and the intelligence community have tried to balance the legitimate needs of public safety against the fear that such spying powers will be misused. When former CIA and NSA worker Edward Snowden leaked a collection of classified documents in 2013, revealing US government electronic surveillance programs, the controversy spotlighted civil libertarians’ grave concerns about threat to privacy. Edgar is uniquely qualified to tell this story. From 2001 to 2006, he opposed the Patriot Act and other efforts to legitimize widespread surveillance. Edgar gained an insider’s perspective of both the actual reach of the NSA’s surveillance capabilities and the rules that limit that power. 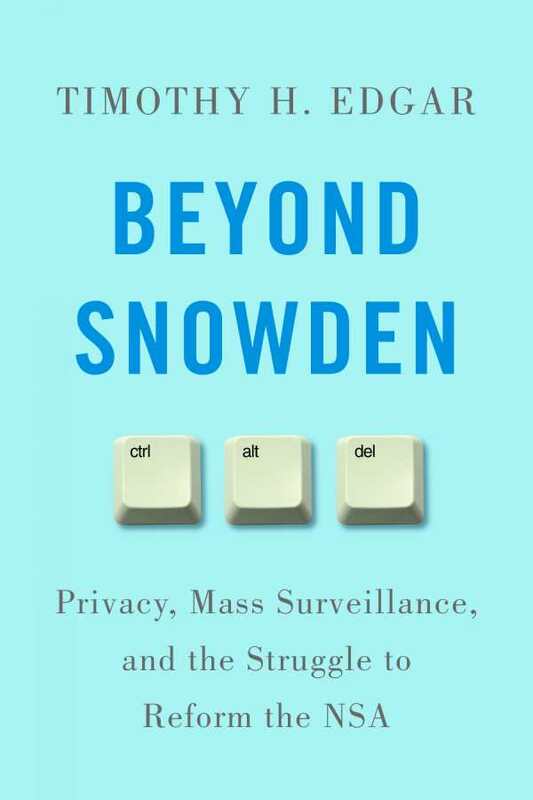 Although Beyond Snowden is modest in length, it is dense with detail and unavoidably complex legal reasoning, particularly in discussing the distinction between NSA treatment of foreign and American communications. Edgar has documented his sources carefully and does his best to present a complicated subject in a clear and succinct manner. As its title suggests, Beyond Snowden does not focus on the details of Snowden’s actions but on what lies beyond them in the past, present, and future. Edgar argues that Snowden performed a useful service by forcing the government to acknowledge the need for reform and oversight of the NSA’s surveillance capabilities. He offers his own set of recommendations, concluding with a plea that “those who work in national security agencies must hold strong to American values.” Existing rules and the professionalism of the United States intelligence community offer some protection for privacy, but “they are not tyrant-proof,” he says, especially under a president who “traffics in dangerous conspiracy theories” and repeatedly expresses disregard for constitutional rights. This is an important book from a uniquely informed source on a critical and timely topic. It deserves widespread attention.